This pull down closet rod features a telescoping pull-rod to provide the length that is correct for you and a weight capacity of 25 pounds. Minimum Cabinet Opening Depth : 14"
Minimum Cabinet Opening Height : 33"
This will work well for us in our warehouse. Please note that our general contractor had to make a wood platform to install on because these do not install to the back wall. It installs on the sides. This product performed exactly as expexted...and fairly easy to install. Good price and very good quality. Much more robust than the photo suggest. Not as pictured. It attaches to sides only. 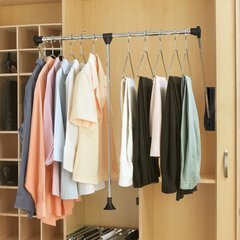 It's an amazing product, I re-designed my closets and this item was just perfect. It's not a flimsy closet rod, it's a work of art.